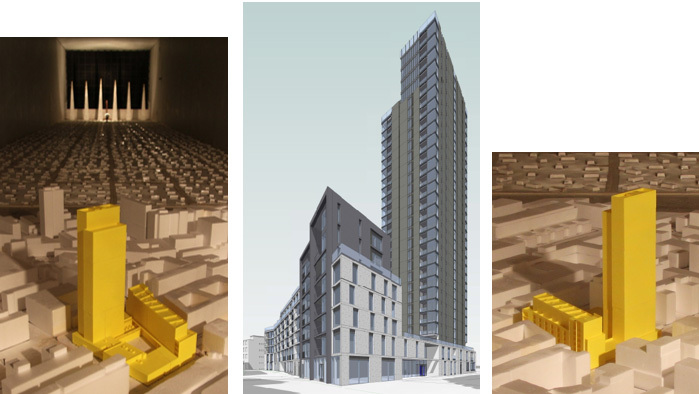 Windtech Consultants recently have been working on the multi-tower development on Nile Street in Shoreditch, London to provide the wind engineering services for the project. Working closely with CBRE, the development consists of numerous buildings, including a main 29 level residential tower located at north-eastern corner of the site. The preliminary client’s concern stemmed from the exposure of the main tower to the prevailing winds and concern for potential down-washed wind effects off the tower form to the ground level areas below. The Pedestrian Microclimate Wind Tunnel study carried out for the planning submission including testing for both the current existing conditions, as well as with the inclusion of the proposed development. This approach enables a clear understanding of the impact of the proposed development on the local wind conditions. Windtech worked closely with the architect and key stakeholders to develop suitable treatment options to ensure desirable wind speed conditions were achieved for pedestrian comfort and to satisfy the requirements for the planning submission. Windtech Consultants opened their London Office in 2014 to provide support for clients and consultants on projects around the world. Since this time, Windtech have worked on a number of key projects throughout the UK, providing early design advice for wind effects and expertise in mitigating adverse problems. In addition to the mentioned Nile Street development, some of the other recent projects include Tiger Way in Clapton, South Thames College in Wandsworth, Marble Arch Place in St George’s Field and Lavington Street development in London.